…There was a grave secular decline in most of western Europe from approximately 1300 to the middle of the 15th century; a period which might be called the Late Middle Ages or the Early Renaissance. This secular decline, mistitled a "depression," permeated most parts of western Europe with the exception of a few Italian city-states. …But the Mary Rose is important not only to maritime historians. It is also what she took with her to the bottom of the Solent in 1545 that gives her a special significance. These were the possessions and tools of 500 men from all levels of society. The 19,000 artefacts that have been recovered range from gunners’ linstocks to gambling dice, from a bosun’s call to a rosary. There is no comparable collection of Tudor artefacts anywhere: no other archaeological site has given us so many insights into Tudor life. No other shipwreck, no other structure and no other collection gives such a clear window into the 16th century. It is no exaggeration to describe the Mary Rose as England’s Pompeii. …Jim Schwenk taught church history for 11 years at Evangelical Theological Seminary, Myerstown. When his position was cut back to part time, he began to look for additional employment to make ends meet. 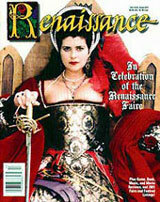 One Sunday in June 2007, Schwenk took his family to the Celtic Fling at the Pennsylvania Renaissance Faire. After stepping foot on the grounds, his son, Tyler, turned to him and said, "Dad, I'm home." Little did Schwenk know that it would soon be his home as well. Within a year, both were hired to work on the maintenance crew. Schwenk eventually became full time, continuing at the seminary where he is now an adjunct professor. Meanwhile, in November, Schwenk was offered a job as pastor at Evangelical Church in Columbia. Despite the church's 35-mile distance from his Myerstown home, Schwenk accepted the position. A parsonage houses the family on weekends. But Schwenck still gives four Sundays to the Renaissance Faire for special events. On those days, someone else does the preaching in Columbia…. The powerful Habsburg dynasty ruled Spain and its empire from 1516 to 1700 but when King Charles II died in 1700 without any children from his two marriages, the male line died out and the French Bourbon dynasty came to power in Spain. Reporting in the open-access, peer-reviewed journal PLoS ONE, April 15, Gonzalo Alvarez and colleagues at the University of Santiago de Compostela, Spain, provide genetic evidence to support the historical evidence that the high frequency of inbreeding (mating between closely related individuals) within the dynasty was a major cause for the extinction of its male line. Using the genealogical information for Charles II and 3,000 of his relatives and ancestors across 16 generations, the researchers calculated the inbreeding coefficient (F) for each individual; this value indicates the probability that an individual receives, at a given locus, two genes identical by descent due to the common ancestry of its parents. They found that F increased considerably down the generations—from 0.025 for Philip I, the founder of the dynasty, to 0.254 for Charles II—as the Habsburg kings tended to marry close relatives more frequently in order to preserve their heritage. Several members of the dynasty had inbreeding coefficients higher than 0.20, which means that more than 20% of the genome is expected to be homozygous in these individuals. The authors cite three lines of evidence to support the theory that inbreeding was a major factor in the extinction of the male Habsburg line, on the death of Charles II. Firstly, there was a very high level of marriage between biological relatives (consanguineous marriage) within the Habsburg dynasty: nine of the 11 marriages over 200 years were consanguineous, including two uncle-niece marriages, one double-first-cousin marriage and one first-cousin marriage. The two individuals with the highest inbreeding coefficient were Charles II and his grandfather Philip III. Although both were the sons of uncle-niece marriages, their F values were almost as high as the expected value for the offspring of an incestuous (parent-child or brother-sister) marriage. The researchers explain that this is likely to be due to multiple remote ancestors of these individuals (remote inbreeding), on top of the high degree of relatedness of their parents. Secondly, there was a high rate of infant and child mortality in the Habsburg families with only half of the children born in the dynasty during the years studied surviving to age one, compared to about 80% in Spanish villages of the time. Alvarez and colleagues calculated that inbreeding at the level of first cousin (F = 0.0625) exerted an adverse effect on the survival to age 10 of offspring of 17.8 % ± 12.3, which could explain the high levels of infant and child mortality. Thirdly, Charles II, dubbed El Hechizado ("The Hexed"), suffered from many different disorders and illnesses, some of which may result from the consanguineous marriage of his parents. According to contemporary writings he was short and weak and suffered from intestinal problems and sporadic hematuria. Children of closely consanguineous couples often have an increased incidence of detrimental health effects due to rare deleterious recessive alleles inherited from common ancestors, although this will depend on how inbred their pedigree is already. Based on this clinical genetic knowledge and on information gathered by historians on the health of Charles II, Alvarez and colleagues speculate that the simultaneous occurrence of two different genetic disorders (combined pituitary hormone deficiency and distal renal tubular acidosis), determined by recessive alleles at two unlinked loci, could explain much of the complex clinical profile of this king, including his impotence/infertility, which led to the extinction of the dynasty. Emmerson, who also holds a courtesy faculty position in the Department of English, is the former executive director of the Medieval Academy of America. In the three decades since earning his Ph.D. at Stanford University, he taught at Georgetown University, Harvard University, Tufts University and Western Washington University (where he chaired the Department of English) prior to joining FSU’s faculty in 2006. His acclaimed interdisciplinary research has focused on apocalyptic themes in medieval art, drama and poetry and on illustrated manuscripts, primarily from England and France, from the 13th through 15th centuries. In 2008, Emmerson was the keynote speaker to more than 3,000 scholars at the 44th meeting of the International Congress of Medieval Studies (not affiliated with the Medieval Academy). In 2007, the Council of Editors of Learned Journals named Emmerson “Distinguished Editor” for his work editing Speculum: A Journal of Medieval Studies from 1999 to 2006. He has served as the deputy director of Fellowships at the National Endowment for the Humanities, and is the incoming president of the Medieval and Renaissance Drama Society. Emmerson has written nearly 40 articles and essays that have appeared in academic journals and scholarly collections and, so far, had six books published, including his first (1981) and best-known book, “Antichrist in the Middle Ages: A Study of Medieval Apocalypticism, Art, and Drama.” He now has been contracted as the editor of the new “Dictionary of Medieval Civilization” that is slated for publication in three or four years by Cambridge University Press. The huge reference work will involve about 175 scholars and 1,300 pages of text. In general, Emmerson explained, medieval studies covers the period in Europe from about 500 to 1500, ranging from Iceland in the northwest to the Islamic Middle East, and from Russia to North Africa. All historically based disciplines of the humanities study the Middle Ages, so the Medieval Academy includes members who study art and architectural history (e.g., Gothic cathedrals); economic, political, and social history (e.g., the plague); Latin and the vernacular languages and literatures (e.g., Dante or Arthurian romances); and philosophy, religion and theology (e.g., Thomas Aquinas). A British academic says he's found proof that Britain's legendary outlaw Robin Hood was an historic figure. Julian Luxford quotes a 23-word inscription in a history book, written in Latin by a medieval monk around 1460; "Around this time, according to popular opinion, a certain outlaw named Robin Hood, with his accomplices, infested Sherwood and other law-abiding areas of England with continuous robberies." Luxford said he found the entry while searching through the library of England's prestigious Eton College, which was founded in 1440 by King Henry VI. He said the note about Hood — uncovered in the margin of the "Polychronicon," a history book which dates from the late 1340s — may be the earliest written reference to the outlaw. First mentions are commonly believed to have been in late 13th-century ballads. Some academics claim the stories refer to several different medieval outlaws, while others believe the tales are pure fantasy. Luxford said his discovery may put to rest debates in England about exactly where Hood may have lived. The northern England county of Yorkshire has long claimed Hood was based there, rather than neighboring Nottinghamshire — even naming a local transport hub Robin Hood Airport in tribute. But folklore has most commonly placed Hood in Sherwood Forest — where he is reputed to hidden from his nemesis, the Sheriff of Nottingham. The forest once spanned 100,000 acres (40,500 hectares) across Nottinghamshire, but has shrunk in modern time to about 450 acres (180 hectares). "By mentioning Sherwood, it buttresses the hitherto rather thin evidence for a medieval connection between Robin and the Nottinghamshire forest with which he has become so closely associated," Luxford said. A brass navigational instrument known as a chart divider is among artifacts recently recovered from a shipwreck thought to be the Queen Anne's Revenge, the ship of the infamous 18th-century pirate Blackbeard, archaeologists said in March 2009…. Underwater archaeologists from the North Carolina Department of Cultural Resources have been excavating the wreck—which lies 22 feet (7 meters) underwater a few miles off Beaufort, North Carolina—since 1997. Navigational instruments were favorite targets of looting pirates, because the tools could easily be sold or traded, said archaeologist David Moore of the North Carolina Maritime Museum, who is working on the wreck site. Also see "Blackbeard's Legend, Legacy Live on in North Carolina." Professor Stanley Wells, Chairman of The Shakespeare Birthplace Trust, and one of the world’s leading experts on Shakespearian studies, today announced the discovery of a portrait of William Shakespeare, which he believes is almost certainly the only authentic image of Shakespeare made from life. The newly discovered picture has descended for centuries in the same family, the Cobbes. It hung in their Irish home, under another identification, until the 1980s, when it was inherited by Alec Cobbe who was a co-heir of the Cobbe estate and whose heirlooms were transferred into a trust. In 2006 Alec Cobbe visited the National Portrait Gallery exhibition ‘Searching for Shakespeare’ where he saw a painting that now hangs in the Folger Shakespeare Library, Washington. It had been accepted as a life portrait of Shakespeare until some 70 years ago, but fell from grace when it was found to have been altered. Mr Cobbe immediately realised that this was a copy of the painting in his family collection. The painstaking work of researching the picture has been carried out over the last three years by Mark Broch, curator of the Cobbe Collection. The research conclusively demonstrates that the Cobbe picture is the prime version of the portrait and establishes beyond reasonable doubt its descent to the Cobbes through their cousin’s marriage to the great granddaughter of Shakespeare’s only literary patron, Henry Wriothesley, the 3rd Earl of Southampton. In addition to the Folger copy, several other early copies of the Cobbe portrait have been located and no less than three of them have independent traditions as portraits of Shakespeare. In two cases the traditions date back to within living memory of the poet—providing compelling evidence that the identification of the sitter as Shakespeare was correct all along. The conclusion that the sitter is Shakespeare is strengthened by the fact that the original picture, the Cobbe portrait, was inscribed with a quotation from the Classical writer, Horace, taken from an ode addressed to a playwright. The original and its copies are being considered together as a group for the very first time. Additional scientific investigation has been carried out to support the research including examination by x-ray at the Hamilton Kerr Institute, Cambridge, treering dating by Professor Peter Klein, Department of Wood Science, Hamburg University and infra-red reflectography by Tager Stonor Richardson. Up to now only two images have been accepted as authentic representations of what Shakespeare may have looked like. One is the engraving by Martin Droeshout published in the First Folio of 1623. The other is the portrait bust in Holy Trinity Church, Stratford-upon-Avon; the monument is mentioned in the Folio and therefore must have been in place by 1623. Both are posthumous – Shakespeare died in 1616. The engraver, who was only in his teens when Shakespeare died, must have had a picture, until now unidentified, to work from. Professor Wells believes it to be the one he has revealed today and that it was done from life, in about 1610, when he was 46 years old. The Cobbe portrait, along with other relevant material, will go on show to the public at The Shakespeare Birthplace Trust in Stratford-upon-Avon from 23 April, Shakespeare’s birthday, in an exhibition curated jointly by Mark Broch and Dr Paul Edmondson, Curator of The Shakespeare Birthplace Trust. Professor Wells said today: “The identification of this portrait marks a major development in the history of Shakespearian portraiture. Up to now, only two images have been widely accepted as genuine likenesses of Shakespeare. Both are dull. This new portrait is a very fine painting. The evidence that it represents Shakespeare and that is was done from life, though it is circumstantial, is in my view overwhelming, I feel in little doubt that this is a portrait of Shakespeare, done from life and commissioned by the Earl of Southampton and believe it could certainly be the basis for the engraving seen in the First Folio. Google "Edward the Confessor" and you'll get page after page of links to biographies of this 11th-century English king, to Westminster Abbey, which he founded and where he is buried, and to the Magna Carta, which was partly inspired by laws enacted during his 24-year reign. But a completely digitized manuscript of the oldest surviving Anglo-Norman history of the king does not turn up — at least on the first 20 search pages — even though Cambridge University painstakingly scanned the sumptuously illustrated manuscript in 2003. That history, "The Life of King Edward the Confessor," probably written by a Benedictine monk named Matthew Paris sometime between 1250 and 1260, is not alone. Somewhere between 5,000 and 10,000 rare and precious medieval manuscripts have been scanned over the past decade into formats that could be studied over the Internet if only scholars knew they existed and knew where to find them. "Searching for medieval manuscripts gets you millions of hits, most of which have nothing to do with manuscripts, and when they do, they usually feature only images of a single page rather than the entire book," said Matthew Fisher, an assistant professor of English at UCLA. "Since finding these great projects is so tough, they're functionally invisible." Fisher set out two years ago to remedy the situation. With the assistance of two graduate students in English, a computer developer from UCLA's Center for Digital Humanities and Christopher Baswell, a former UCLA professor of English, Fisher decided to collect links to every manuscript from the eighth to the 15th century that had been fully digitized by any library, archive, institute or private owner anywhere in the world. In December 2008, the group launched the initial results. The UCLA-based Catalogue of Digitized Medieval Manuscripts now links to nearly 1,000 manuscripts by 193 authors in 20 languages from 59 libraries around the world, allowing users to flit from England to France to Switzerland to the United States — to name the locations of just a few of the featured repositories — with the click of a mouse. The largest surviving collection of the works of Christine de Pizan, one of the first women in Europe to earn a living as a writer. The manuscript was commissioned by Queen Isabeau of France in 1414 and is now held by the British Library. An Irish copy of the Gospel of John, bound in ivory and presented to Charlemagne sometime around 800, now in the library of the monastery of St. Gall in Switzerland. The Junius manuscript, one of only four major manuscripts preserving poetry in Old English. Dated to around 1000, the book is now among the holdings of Oxford's Bodleian Library. "Because these manuscripts are so old and fragile, libraries are digitizing them, but you can't find them," Fisher said. "We're completing the step of making them accessible to the world." Employing a Web application designed by the Center for Digital Humanities, which promotes the use of computer technology in humanities research and instruction, the Catalogue of Digitized Medieval Manuscripts allows users to search for manuscripts according to their author, title, language and archiving institution. In its first three weeks of operation, the site had almost 5,000 visitors from Australia, England, France, Italy, Germany, Spain, the Netherlands, Sweden, Switzerland, Austria, Canada and all over the United States. In addition to librarians and academics, the site has been visited by hobbyists from such groups as the Society for Creative Anachronism. "The chorus of response has been, 'Thank you,'" said Fisher, who joined UCLA's faculty in 2006. "'We needed this.'" That's music to Fisher's ears. A member of a new generation of scholars who cut their teeth in the San Francisco Bay Area during the dot-com era, the Los Angeles native is motivated by a commitment to democratize access to some of the world's most exclusive repositories. "The price of admission shouldn't be a plane ticket to a library in Europe or even Australia," he said. "These documents are part of the world's cultural patrimony. Everybody should have access." So far, the effort has been funded by UCLA's Center for Medieval and Renaissance Studies and the University of California's Humanities Research Institute, a multicampus center designed to promote collaborative and interdisciplinary humanities research. But Fisher hopes eventually to get outside funding to speed up the process. He also hopes that libraries will start taking notice of the effort and revamp their cataloging procedures to make it easier to ferret out and link to newly digitized manuscripts. "Now that UCLA has delivered the solution, it's time to get everybody involved," Fisher said. Ultimately, he envisions including every medieval manuscript that has been digitized it its entirety. "We'll never replace the joy of sitting down with an 800-year-old book," he said, "but we will bring the wonder of these manuscripts to people who might never experience them otherwise." To view the e-catalogue, visit http://manuscripts.cmrs.ucla.edu.